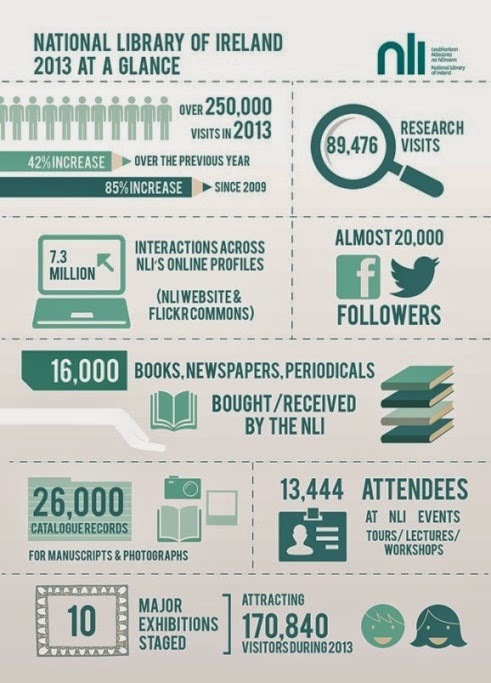 The National Library of Ireland (NLI) has today published its annual review for 2013 (pdf 2.15Mb), a year when more than a quarter of a million people visited the Dublin institution. Speaking at the launch event, NLI Acting Director Catherine Fahy said that the results indicate a Library that is still achieving good results and bringing important collections to the public. "Hard times continue," she said. "But today is an opportunity to recognise the achievements that the NLI has made against the odds. "The NLI is facing huge challenges and it is of considerable concern that, since 2008, we have suffered from year-on-year funding cutbacks, and now receive 44% less funding than we did five years ago. Coupled with decreasing numbers of staff and increasing demand for our services, this means we are being squeezed from all sides. "Diminishing resources put collections and services at risk. While we work tirelessly to maintain both, we are at a critical point." On the genealogy front: the NLI's Family History Room, which runs a year-round free genealogy service, saw 62,863 visits over the year (2013 is the first year the numbers have been counted), while just under 1,000 attending the 21 Genealogy At Lunchtime lectures during July and August, which were organised by the Library itself. Other key highlights from the 2013 review can be seen in the infograpic, below, produced by the NLI.